As modern homeowners we’re increasingly drawn to create living spaces that embody our character traits, as well as create an atmosphere that resonates with our personal style. Successful kitchen designers don’t just design kitchens. They create artworks. 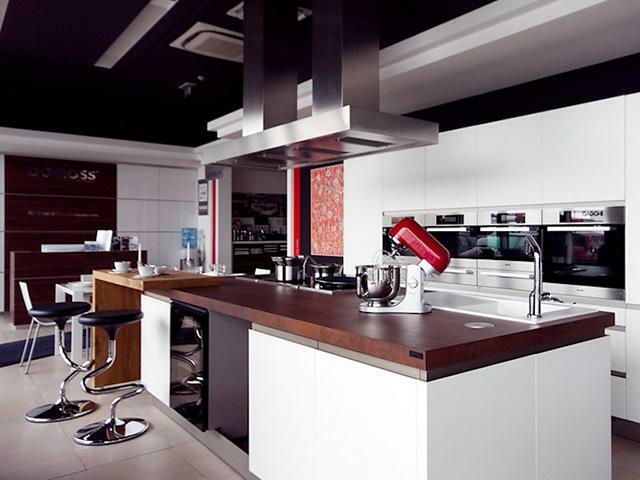 The good news about design in 2014 is that you can collaborate with a designer or kitchen manufacturer to achieve an amazing, personalised design! With incredible online resources at your fingertips such as Pinterest, housebeautiful.com, houzz.com and a host of local décor magazines, tracking trends that inspire your creative side is quite easy. 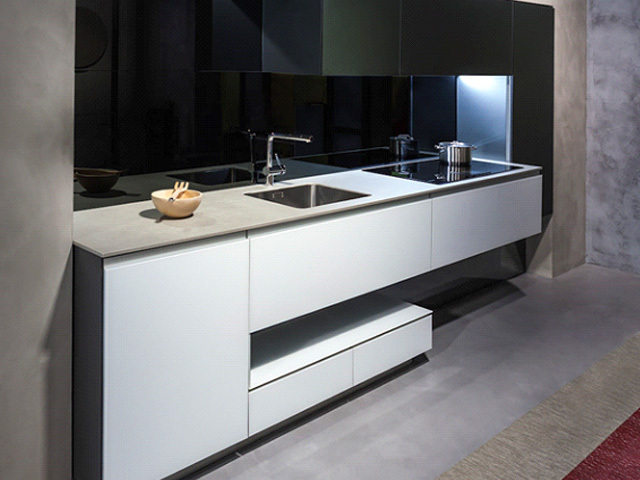 NEOLITH brings you nine kitchen design ideas for 2014. The selection of the right colour palette for you and your kitchen is probably the most underrated aspect of kitchen design, as colour often dictates the mood of a space. 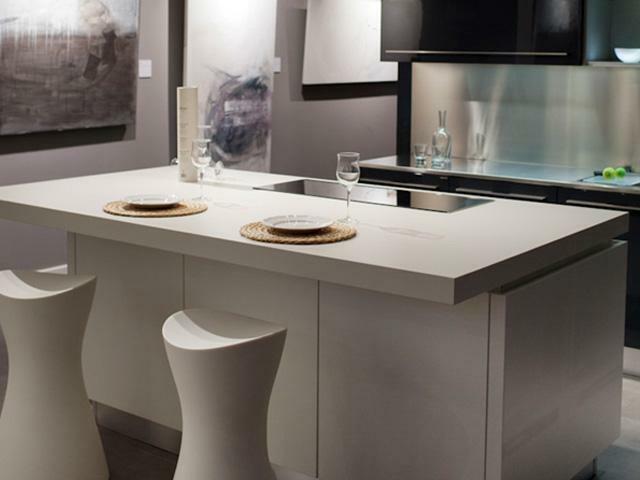 White as a dominating colour in the kitchen is not a new trend, but it has certainly prevailed over the past decade. Whites fall into the neutrals category and by their very nature offer a versatility that will serve the space for many years to come. If you’re set on creating a monochromatic look in your kitchen, be sure to combine many textures to create focal points for the eye. Texture is the answer to avoiding a multi-coloured nightmare design. If you’re looking to create an exciting space, multiple colour use is definitely not the way to do it. Visual interest can be created by reducing the number of colours being used in the kitchen in lieu of adding more textures. Our fast-paced, high stress urban lives leave us longing for a renewed connection with nature. Designers have begun to incorporate natural-looking materials into spaces in order to reduce homeowners’ stress and to create a serene atmosphere. Our homes have become places where we need to recharge and rest, and it is important that our spaces assist with this lifestyle requirement. Timber, glass, steel, porcelain and stone are perennial materials that will look good in the kitchen for many years, and with a timeless design you should be able to comfortably keep your kitchen for a decade or two. 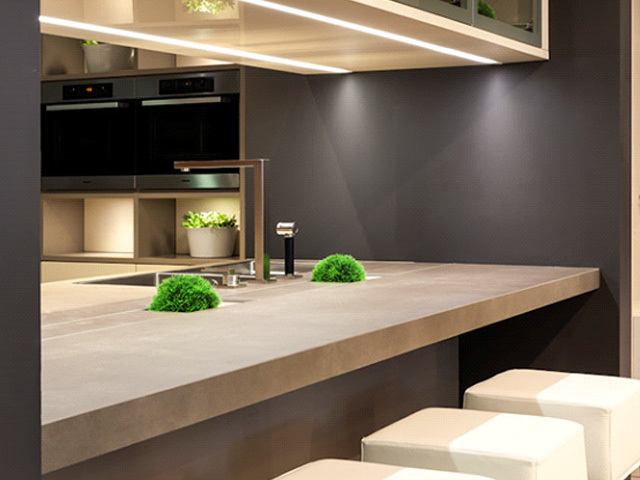 As a sintered porcelain NEOLITH can be considered a natural material – it is literally baked using a mixture of feldspar, silica and clay making it an exceptionally nature-based and environmentally friendly product. 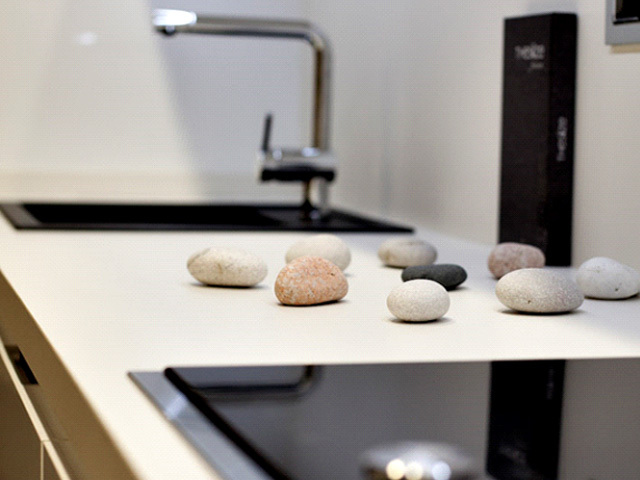 NEOLITH’s amazing heat resistance and stunning matte texture also make it the ideal countertop material. The classics are often simple in their design, be it a car, dress or sculpture. Simplicity is one of 2014’s trends to look out for as people again try to calm down their personal spaces to recover from a frenetic pace of life at work and in social spheres. Holistic use of materials can often achieve a simplistic, calming look and feel to the kitchen. 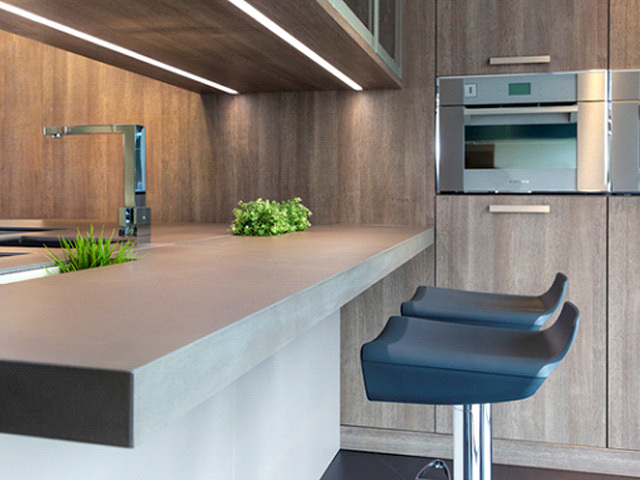 NEOLITH is unusual in its versatility as it can be used as flooring, wall cladding, door cladding, splashbacks, countertops and cupboard cladding. Imagine the Palace of Versailles… Now imagine the complete opposite of that. That’s what’s happening in kitchen design. The frills and fuss are being exchanged for straight lines and monotone colours. Opulence and wealth are no longer expressed in technicolour and intricate patterns – instead, today these qualities are more associated with ‘cheap and cheerful’ design. The technology and information revolution has opened the gates to knowledge of all kinds, including DIY and design. In the past homeowners may have been happy to consign the material specifications, design and overall look and feel of the kitchen to an outside designer, but these days the average homeowner has a new basic level of understanding about many things ‘design’. This makes for a pesky client in some ways, as everybody weighs in on virtually every decision, but layman / professional collaborations can often lead to fresh sparks of creativity and effective kitchen design solutions all round. Do your homework and you’ll doubly ensure you get the outcome you’re planning for with your luxury kitchen design. With the rise of the eco-conscious, hipster sub-culture and the growing sustainability movement worldwide, homeowners are eco-product aware like never before. If you’re renovating be sure to find out how your builder is planning to dispose of your old kitchen. You might find a willing recipient for it, but ensure that materials that could be reused or recycled find the right endpoint. 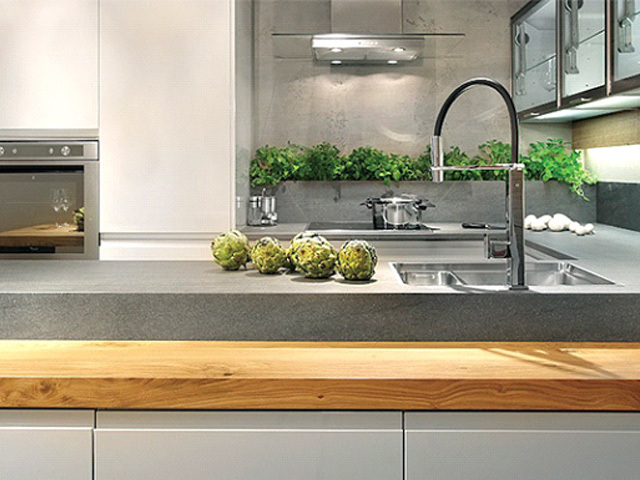 Including environmentally friendly kitchen elements into your design is first prize. This year there are energy-efficient light bulbs, water-wise dishwashers, CFC free refrigerators and ovens that switch off automatically when the timer hits zero – plenty of options when it comes to appliances. In terms of the structure of the kitchen it’s always a good idea to ask your designer which brands for each kitchen element offer eco-friendly products. Sometimes these are a bit more expensive, but you can rest easy knowing the manufacturers have gone the extra mile to produce their products fairly and responsibly. Some ‘green’ ratings you should look out for are ISO 14001, Greenguard and Ecospecifier. Another big trend this year is subsistence farming. 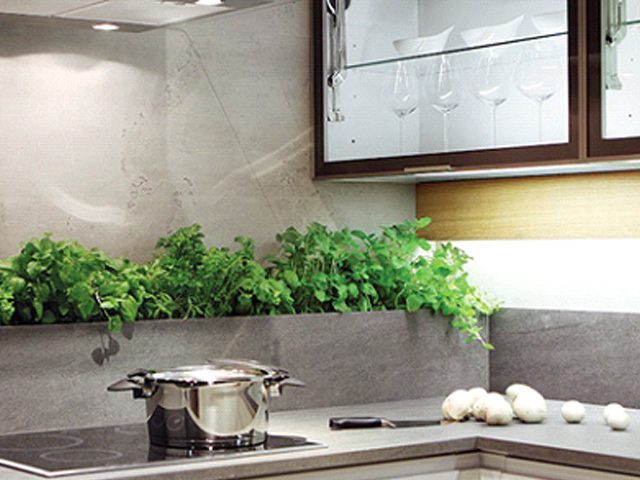 Why not include a living wall in your kitchen where you grow herbs and lettuces for cooking? Few of us are privileged enough to claim the title of full-time homemaker, which means more often than not we’re stretched for time and desperate for a low maintenance kitchen. Surfaces are the major concern in the kitchen as they’re used multiple times during the day and often reveal the general state of your kitchen. Laminates, although the cheapest kitchen countertop option, don’t last well at all and pick up scratches, chips and discolouration all too soon. Marble is a beautiful natural material, but isn’t recommended for kitchen countertops as it’s a soft and porous stone that requires great care and a lot of maintenance. Granite countertops make for hardier kitchen surfaces, but they also require maintenance and can’t handle hot pots without the risk of thermal shock, which causes cracking and sometimes discolouration. 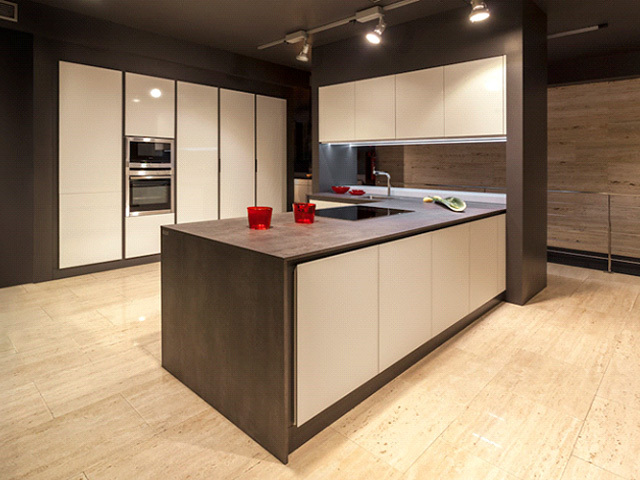 NEOLITH sintered porcelain is a new surface solution that offers incredible heat resistance, longevity and durability and requires almost zero maintenance. For slightly less cleaning, opt for a slightly darker neutral colour countertop rather than white, as white colours will show dust and dirt more easily. Having a dishwasher on hand, and concealed within the cabinetry, will also help with reducing the general mess as you can stack dirty dishes away immediately after use. With world economies groaning under slow growth, your 2014 kitchen designs should be designed with longevity and general appeal in mind. Estate agents will tell you that the kitchen and the garden are major selling points for any home, so unless you are planning on staying in your home for a few decades it’s best to keep this in mind when planning your kitchen. Classic design offers the broadest appeal, but a cleverly functional kitchen means you will love your kitchen for more than just its good looks! Take time planning your design and call in the advice and opinions of some clever DIY friends – they might just have some valuable input that could change your design for the best.